Windmill blades are offloaded at the wind farm site in Solomon Forks, Kan. Engie North America is building a pair of wind farms in Thomas County that will have a combined power-generating capacity of more than 470 MW. 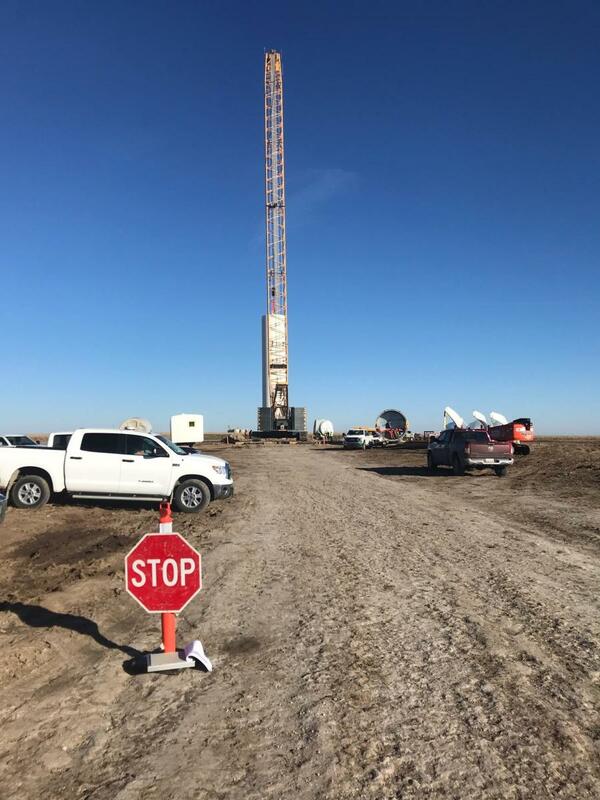 A flat, dry portion of northwestern Kansas, where, just as in Oklahoma, "the wind comes sweeping down the plain," is the home of a pair of large turbine wind farms currently under construction. Each are designed to provide the local population and a couple major companies with clean, renewable energy. Engie SA, a French energy company, through its North American entity, began work Nov. 1 on the 196-MW East Fork wind project in Thomas County. The wind farm will encompass 72 turbines, each with a capacity of 2.72 MW and sporting rotors 393 ft. in diameter. The cost of the bringing the project to completion by late 2019, and online by the next April, will be $228 million. A few miles to the west, across Interstate 70, Engie's even larger Solomon Forks Wind Project has been under construction since late September. When finished around the end of July 2019, that wind farm will have a total capacity of 276 MW, after a capital investment of about $334 million. Its 105 turbines will each yield 2.625 MW of power. The general contractor for both projects is M.A. Mortenson Company, a multi-office concern and one of the country's leaders in the construction of clean-energy projects. Nick Knezevich, project engineer of the North Dakota company behind the design of the two wind farms, described them as distinct, yet similar, projects. "At one time, they were planned as one large project, but that is no longer the case," said Knezevich, who works for Ulteig Engineers Inc., based in Fargo, N.D. "They have the same GC in Mortenson, but in operation they will utilize different turbines. I would describe them as close, but different." The East Fork Wind Farm will provide power to the 7,900 residents of Colby, the seat of Thomas County, as well as to several other nearby communities, while the electricity generated by Solomon Forks will benefit companies such as T-Mobile US Inc. and Target Corp.
For the right to locate the wind turbine facilities in Thomas County, Engie North America also will give annual payments to local landowners, create many areas jobs and provide other benefits to county residents. The earthmoving and construction involved at each of the wind projects is more extensive than one might think, Knezevich said, involving work in multiple areas that were cleared for the construction operations sites, the substation sites, and the operations and maintenance building sites. 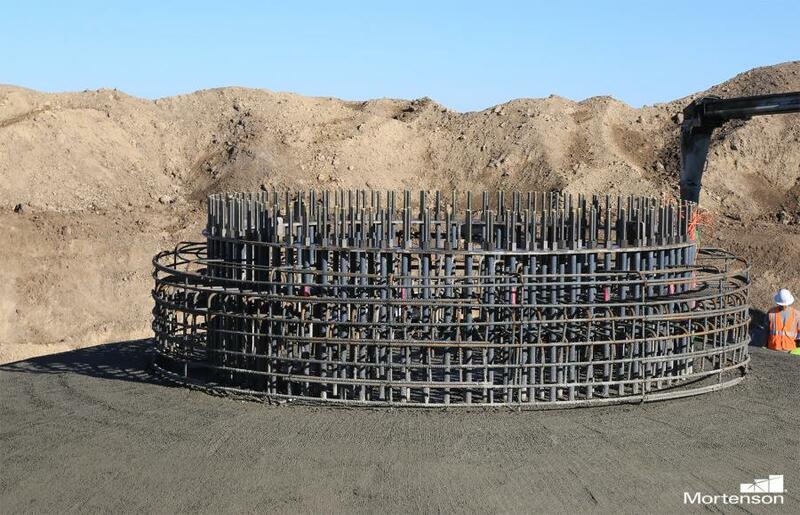 "In addition, there are large concrete basins for each of the wind turbines and, of course, they require significant concrete pours, as well as for 100 percent of the underground collection systems for the wiring together of the turbines," he added. "That means there are, cumulatively, hundreds of miles of trenching, plus the backfilling for the turbine pedestals." In addition, before work could begin, many miles of local country roads needed to be improved and stabilized to make them suitable for the heavy hauling of large equipment and components needed for the turbine systems. Some roads and intersections were reshaped to accommodate the turning radius of flatbed trucks more than 100 ft. long coming to the job sites — most transporting towers, turbines and blades, Knezevich said. Oversized power transformers also are being brought to each wind farm by lowboys designed for heavy loads. Manufacturers from across the country make the various components needed at each wind farm. At Solomon Forks, the turbine blades are made by Siemens Gamesa, while East Fork blades are supplied by General Electric. Each blade is between 95 and 115 ft. long. As of the end of the first week of November, a combined total of about 190 workers from various construction and engineering firms were employed at both sites, according to Knezevich. He expects that number to become even larger as construction ramps up in the spring, when the towers, turbines and blades will begin to be erected. "Ulteig drew up the design for the Solomon Forks plant and a portion of the East Forks plant," he explained. "As well as our engineering services, Ulteig does construction management and project management services for our clients. I work within that group and provide full, life-cycle management for the client, which in this case is Engie." Engie North America, based in Houston, manages a range of energy businesses in the United States and Canada, including clean-power generation, cogeneration and energy storage; retail energy sales; and services to help customers run their facilities more efficiently and optimize energy and other resource use and expense. Nearly 100 percent of the company's power generation portfolio is low-carbon or renewable. Globally, Engie is the largest independent power producer and energy efficiency services provider in the world, with operations in 70 countries employing 150,000 people, including 1,000 researchers in 11 research and development centers.